N8 ST9 (Nate Stein) has been on my radar for some time. The post-electronic artist mixes skilled instrumentation with dreamy electronica to create a delicate sound that, while heavy on the electronic percussion, is harmonious. Now, on the heels of his new album Full Circle, I believe it is a good time to introduce him to the readers of this blog. This aforementioned mixture is musically intriguing. Perhaps most engaging about the new album is its vibe. 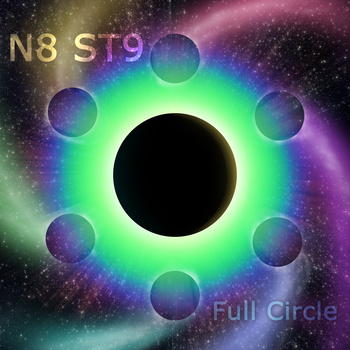 Electronica and instrumentals sometimes conflict when haphazardly paired together, but N8 ST9 combines the two elements competently, thus creating a cool, euphonic atmosphere that surrounds the listener. The album is split between pure electronic instrumentals (like the two reviewed below) and pop-fueled tracks like “Light Up Myself,” which ST9 wrote for a close friend who is a recovering alcoholic. Aside from the imprecation outburst to begin the song, “Light Up Myself” is a diverse song that has three distinct parts. The song begins with an ethereal guitar riff that transitions into a Paul Simon-esque verse with creative percussion, which continues even when the song shifts to a modern Indie rhythm. In only two minutes the song effortlessly shifts back and forth from different musical elements and inspirations. This is just accentuated towards the end of the song with the airy piano bridge fit with melodious vocalization. ST9 takes listeners through a musical parade, successfully evoking the ups and downs of his friend’s life. The above two tracks are the diverse instrumentals I mentioned. “Intention for Bliss,” the opening track on the album, features the fluffy keys reminiscent of an Owl City song. “Watching” features more driving electronica (something I don’t usually go for). In this case, though, I am lured by the 80s beats that blend well with the melody ST9 successfully introduces to the listener. It’s an impressive release for the young artist, and I am looking forward to listening to more of his music.